Multi-Platinum recording artist and global icon Gwen Stefani and childhood cancer survivor Kaila Elder cut the ribbon to officially recognize the new home of Cure 4 The Kids Foundation in the One Breakthrough Way building on the Summerlin campus of Roseman University of Health Sciences. Cure 4 The Kids Foundation is Nevada’s only nonprofit childhood cancer treatment center. Stefani and Elder are joined by administrators, physicians and staff of Cure 4 the Kids Foundation, as well as representatives of Roseman University of Health Sciences, Howard Hughes Corporation, community members and guests. Photo by Tonya Harvey. 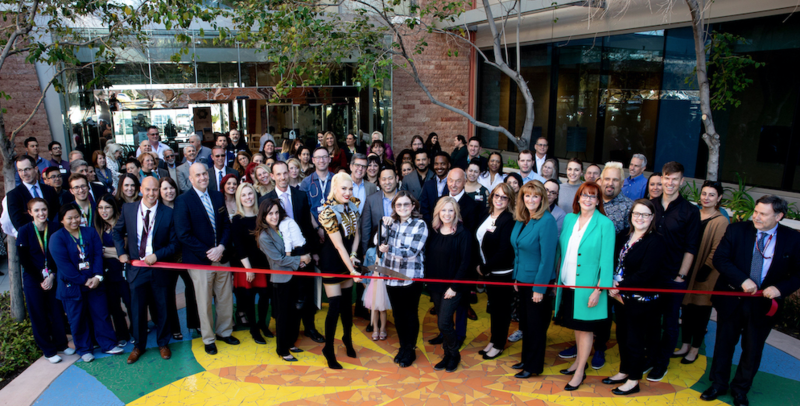 During a special recognition and ribbon cutting event, Cure 4 The Kids Foundation and multi-Platinum recording artist and global icon Gwen Stefani revealed the first-ever themed exam room for patients of Nevada’s only childhood cancer outpatient treatment center. Stefani worked with Cure 4 The Kids Foundation to inspire the design of a themed exam room that allows patients to receive medical check-ups in a brightly colored, inspirational and joyous atmosphere. Las Vegas artist Juan Muniz completed the illustrations which cover the exam room walls and incorporate a likeness of Stefani, and images of sunflowers, one of her favorite flowers; bananas, a reference to her hit single ‘Hollaback Girl;’ and oranges, an homage to her hometown Anaheim, located in Orange County, Calif. Special considerations were made in the materials used to transform the room; medically necessary to protect patients, including special microbial resistant glossy paint and bacteria resistant furniture. As part of her Las Vegas residency, Stefani, Live Nation Las Vegas and Caesars Entertainment are donating $1 of every ticket purchased to “Gwen Stefani – Just A Girl” at Planet Hollywood Resort & Casino to Cure 4 The Kids Foundation, which is Nevada’s only nonprofit childhood cancer treatment center. So far, ticket sales have netted more than a $50,000 donation that will be used to help Cure 4 The Kids Foundation expand into a new wing at its location at One Breakthrough Way. The additional space will increase the number of examination rooms and allow for greater research capabilities. “Gwen’s support of our clinic has been tremendous and has helped us bring greater awareness of the excellent treatment we provide, as well as the fact that no child is ever turned away from treatment for financial reasons,” said Annette Logan-Parker, president and CEO of Cure 4 The Kids Foundation. Prior to the debut of the exam room, a ribbon-cutting event took place to officially welcome Cure 4 The Kids Foundation to the One Breakthrough Way building on the Summerlin campus of Roseman University of Health Sciences. Earlier this year, Cure 4 The Kids Foundation became an independent division of Roseman University of Health Sciences. The partnership will give Cure 4 The Kids Foundation physicians greater access to academic research, clinical trials, as well as educational programs. Roseman University students pursuing degrees in dental medicine, pharmacy, nursing, and health care administration will benefit from the clinical experiential opportunities by shadowing Cure 4 The Kids Foundation physicians.